In a blog post last year about the importance of women in agriculture, I recommended the original Girl Effect video, which blew me away with what it said about the role of girls in ending poverty and hunger -- and by how it said it. This year it's the new video above that's got me going, and the Girl Effect blogging campaign, timed to coincide with International Children's Day on November 20, presents a perfect opportunity to catch up. After all, women in agriculture were once girls in agriculture. What do we see when we run the clock back? The statistics tell us that women grow 80 percent of the food eaten by poor families in developing countries. The Girl Effect tells us that many of these women are really just girls. Instead of going to school, they spend up to 16 hours a day working to grow food on their farms and fetching fuelwood and water. At every age, women struggle to get the seeds, fertilizer, training, and credit that might help them grow more and earn more -- extra resources that would in turn help keep girls in school. There's another way that agriculture supports the Girl Effect if we turn the clock back even further to pregnancy and the first 2 years in the life of a girl or boy. A child who receives the right nutrition during her first 1,000 days is less likely to die or be harmed by disease for the rest of her life! Sadly, the opposite is also true: a child that doesn't get enough of the right kinds of foods during this period faces irreversible health problems. 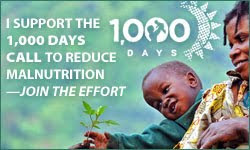 To find out more, check out the 1,000 Days campaign, another great cause with another great video. Although many of the poorest families in the world live on farms, they suffer from the 'hidden hunger' of under-nutrition. These families can usually grow enough to keep everyone alive, but their cheap and reliable staple crops aren't nutritious enough to supply all the vitamins and minerals that growing young bodies need in order to thrive. Promoting home gardens to grow healthy fruits and vegetables helps -- as does providing vitamin supplements and processed foods that are fortified -- but there are still about 200 million children under the age of 5 who suffer from from chronic under-nutrition. More can and should be done. Last week I was at the first Global Conference on Biofortification, with agriculture researchers and nutritionists who are working together to breed crops that are just as easy to grow but are a lot more nutritious. I'll write more about that soon, but to steal a line from the original Girl Effect video, do you see what's going on here? Better crops > more nutritious food > healthier babies > healthier girls > the whole world is better off! The specificity of this post... 80% of the food in developing countries is grown by females - many young, young girls who would benefit from being in school... wow. Grateful to meet another GirlEffect blogger this morning. Read my girl effect post here. Thank you for jumping into to support the Girl Effect blogging campaign! This adds such an important component to the discussion. It's mind-boggling that women are growing 80% of the crops that feed everyone - but not sharing in social or political power. And I'm glad to learn about the 1000 days campaign too.